(Phys.org)—Neurons might not be able to send signals as fast as electrons in wires or photons in fiber, but what if they can communicate using miniature sonic booms? That would be quite a revolutionary discovery. A group of mechanical engineers at Boston University have recently found that two-dimensional shock waves reminiscent of propagating spikes in nerves can be induced in monolayer lipid membranes. Their fascinating results, which have been sitting on the Arxiv server since November, have just been approved for publication in an upcoming issue of Physical Review E.
The idea that action potentials in neurons are acoustic pressure pulses has gained a lot of experimental support. Shamit Shrivastava and Matthias Schneider were previously able to directly observe solitary waves in membranes using an optical technique known as fluorescence resonance energy transfer, or FRET. Following that, Thomas Heimburg's group demonstrated that counter-propagating action potentials don't annhilate in nerves in they way they would be expected to if they were purely electrical spikes possessing refractory periods and channel inactivation. In work that is largely complimentary to these shock studies, Heimburg has shown that the pulses survive collision and continue to travel in their opposite directions. 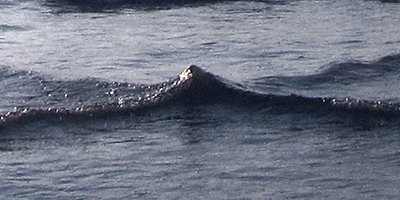 Although solitary waves and compressive shock waves (and for that matter expansive ones too) are not mutually exculsive, shock waves generally differ in that their energy quickly dissipates with distance. A unique feature of a shock disturbance is it can travel significantly faster than an ordinary wave in a given media. To demonstrate that these effects exist in lipid monolayers, Shrivastava and Schneider (together with Kevin Heeyong Kang) varied the amplitude of the shock compression and measured the velocity of the propagating wave in a special setup known as Langmuir trough. They report a relationship between interface pressure and density under adiabatic conditions—conditions where there is no heat exchange—which yields an adiabatic state diagram. Shivastrava mentioned that the general literature on shock and detonation may shed light on the interaction of chemistry with sound waves. In particular he suggests ion channels might actually feed a sound wave and compensate for the dissipation that has to be expected from propagation. This conception bears some resemblance to other ideas recently proposed regarding the natural decay of pressure pulses in the viscoelastic medium of the nerve. According to one hypothesis, pulses in myelinated nerve segments would be mechanically refreshed by ionic input at the nodes, while the muscle end-plate also participates in the pulse after amplification by acetylcholine release in the cleft. One reason why many ion channels also appear to be mechanosensitive may in fact be because of coordinated lipid motions on the relevant scales. State diagrams and thermodynamic relationships may at first seem to be a bit removed from the everyday biophysical world of spikes in protein-rich bilayers of neurons. However, we should not fear to tread further. 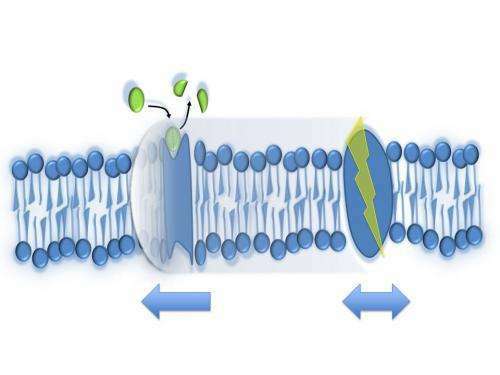 The particular form of the state diagram determines many critical parameters of excitations in lipid membranes including the shape, stability, and velocity. While the pressures and temperatures relevant to lipids may be different to those in sonic booms generated by supersonic aircraft, much of the underlying physics is the same. Having this physics base distinguishes these experiments from other kinds of claims of percussive booms in neurons which one may have recently heard about. Here I am speaking particularly about the kinds of 'brain shocks' hypothesized to occur from the self-propagating decomposition of peroxynitrate compounds in the brain or sensory organs. In this case, a small detonation pulse producing charged betaines would apparently liberate heat with subsequent pressure increases and local gasification. Shivastava's work we should mention, would actually predict that liberation of heat near phase transitions can actually lead to condensation in lipids. In contrast to this kind of fantastical speculation about betaine detonation, the thermodynamic measurements now being made in neurons have a deep history. Many of the ideas currently being explored can be traced to the work of Konrad Kaufmann, who among other pursuits developed a theory of proton action at cholinergic synapses (e.g. neuromuscular junctions). Some of his early propositions of acetlycholinesterase being an enzymatic 'proton pistol' (which led to later ideas about the thermodynamics of nerves) are now being confirmed experimentally. In another paper on the Arxiv server, Schneider and Christian Fillafer demonstrate membrane depolarization and spike generation by hydrolyzed acetylcholine. In other words, we now have another heresy here implying that it is not so much ACh's action on receptor proteins that generates membrane activity, rather, the rapid breakdown of ACh by acetylcholinesterases releases protons which then excite the postsynaptic membrane. These new experiments were not done in neurons, or even in the often used frog oocytes since there are several complicating variables at play. For instance, oocytes have intrinsic esterase activity as well as ACh-sensitivity which in practice needs to be supressed by addition of inhibitors like atropine. These acetylcholinesterase can actually be found in a lot of places one might not expect them. They are in the eggs and sperm, the placenta and early differentiating embryo, in red blood cells in some organisms, and directly in the blood of others. Instead of the usual suspects, here the researchers used excitable Chara australis internodal cells—a plant cell which has a long history of use as a model system in electrophysiological experiments. While action potentials were observed in frog preparations as early as the nineteenth century, the first intracellular electrode recordings of action potentials were done in Chara cells—some ten years before the famous squid axon recordings. This general concept of proton excitation may extend to other transmitters like excitatory amino acids, or even to bases like serotonin. One might, for example, want to investigate whether glutamate is deprotonated in the synaptic cleft. The established mechanisms taking place in the presynapse, where the pH-dependant uptake of glutamate into acidic vessicles happens, may or may not support instances of glutamate being released in protonated form. In talking to Shivastava and to Fillafer, I get the feeling that we should expect a lot of revolutionary new work coming out of their lab. We will have more to report here soon about these cutting edge experiments. Excerpt: "...what if they can communicate using miniature sonic booms? That would be quite a revolutionary discovery." Agreed. Their approach seems to limit use of what is already known about the concept of proton excitation and amino acid substitutions that appear to differentiate all cell types of all individuals in all species. It is really not relevant here for sonic booms, (although all intelligent or otherwise thoughful comments are welcome, especially when it is the first) but it is interesting to note how various species have differentially substituted their serine proteases, in particular in regards to converting them into esterases with all the many nuances of AchE's, like for example, conversion of the main catalytic bind gully where glutamate has been substituted into the main triplet. This research takes a critical step toward integrating biophysical fields (sound, opto-mechanical, electric, et al.) from the standpoint of solitary and shockwave dynamics at negatively curved lipid membranes. A couple of thoughts: The phenomenon of heat block may be somehow analogous to the hypothesized DNA soliton model and DNA melting. The phenomenon of sonoluminescence perhaps might be relevant here. Not very familiar with DNA melting/solitons, but the authors do discuss transitions that occur with heat block that lead to instabilities in the shock wave (Fig. 5) and note all action potentials show heat block. I imagine cold block or shock block is possible too. This isn't the first suggestion that some neurons have mechanosensitive action potentials. Encarsia formosa and a few related fairyflies have axons so thin that even one channel opening would trigger an action potential. It's been proposed that their neurons work mechanically instead of electrically to avoid that problem. If the results hold up, this could explain some neural phenomena in much the way volume transmission has. Not rewriting everything we knew before, but an important additional layer. Re: "...it is interesting to note how various species have differentially substituted their serine proteases..."
The differentially substituted serine proteases appear to link nutrient-dependent amino acid substitutions to the biophysically constrained protein folding that differentiates cell types via phospholylation when the "switches" in cell types are fixed by the pheromone-controlled physiology of reproduction in E. coli, C. elegans et al. A JVK-Skippy fan, eh Cher? but it is interesting to note how various species have differentially substituted their serine proteases, in particular in regards to converting them into esterases with all the many nuances of AchE's, like for example, conversion of the main catalytic bind gully where glutamate has been substituted into the main triplet. Well golly gee john-maybe-hew-Skippy, you took the same class in gobbledygook as JVK-Skippy. How come you two show up as the matched set all the time? Oh yeah, I almost forget. I'm not being disrespectful, non, I'm just making the fun with you for writing something that nobody but you or JVK-Skippy could appreciate. Ira, as is your pleasure with your thoughtful notes, I also just wrote what came most easily from head there. You are welcome. I am not so busy today, so it's no trouble at all non. I also just wrote what came most easily from head there. Well Cher, just between you and me, if I had such stuffs as that rattling around in my head I would try to get the appointment with the doctor that treats mental conditions. Could you answer a simple question for ol Ira-Skippy? How come you only write that sort of gobbledygook on the comment places? Nothing in the articles sounds so weird as that. It is almost like your are the split-in-two personality. Oh yeah, I almost forget. You never answered the Real-Science-Skippy either, but I'll try again. You are not the the John-Hewitt-Skippy that writes the articles are you? You just pretend like you might be him without actually claiming to be him, right? Well, my "country sense" likens this to a bow wave/wake phenomenon. I recall a recent finding that PTSD and the old WWI "shell shock" diagnoses have been connected to brain damage due to exposure to sonic 'booms' from exploding ordnance. Thanks tadchem. That's the type of information that could be discussed here if the science idiots were eliminated. Obviously, intelligent people could expect epigenetic effects of vibrations as readily as we could expect epigenetic effects of odors. The link from odor exposure associated with "shell shock" to fear memories is one that also links primary associations to their secondary associations in species from microbes to man via the biophysically constrained chemistry of protein folding, which includes epigenetically effected protein folding in the brain during and after its adult development. Obviously, intelligent people could expect epigenetic effects of vibrations as readily as we could expect epigenetic effects ... which includes epigenetically effected protein folding in the brain during and after its adult development. @Ira - and you've the nerve to accuse John of talking gobbledygook? Or having a "split personality" while constantly refering to yourself in the third person..? @Ira - and you've the nerve to accuse John of talking gobbledygook? Well Mr-Smarty-Pantaloons-Skippy, maybe you could explain in your own words just what all that really smart scientifical biodegradable stuffs he said means? Or having a "split personality" while constantly refering to yourself in the third person..? Yeah I said that too. But at least while I'm referring to me or to not me or somebody else I always sound like me and never sound like JVK-Skippy. I was not protestingth to much. I was making the fun with Probably-Not-John-Hewitt-Skippy. But if you got fooled by him I will make some fun with you too Skippy. Yeah that might explain it. But do ever notice how the Probably-Not-Hewitt-Skippy always gets real busy whenever somebody asks him point blank if he is the real John-Hewitt-Skippy or JVK-Skippy pretending to be him? Real-Science-Skippy asked him and he disappeared. Then Captain-Skippy asked him another time, and he disappeared again. The Ira-Skippy ""Theory of the Probably Not the Hewitt Skippy"" is that it is JVK-Skippy trying to make us think there is one somebody somewhere in the world that thinks he knows something. Because he only shows up to rub JVK-Skippy's belly, and writes stuff that sounds like JVK-Skippy and not the John-Hewitt-Skippy who writes the articles. Oh yeah, I almost forget. Little-Ira-Skippy told me it was easy to steal the picture off the interweb and post him when you join the places like this.. I did notice John Hew looks like a skinnier version of JVK. Brothers, maybe? That's the type of information that could be discussed here if the science idiots were eliminated. Those "idiots" being the entire group who prefer not to be spammed with your peculiar nutrient-dependent-pheromone-controlled crackpottery. That would leave how many, would you guess? On the chance you believe otherwise, neither you, with your winning personality, nor your crank science are embraced here.